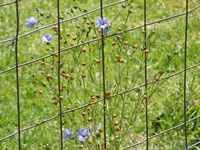 Flax, (also known as common flax or Linseed), is a hardy, erect annual with slender stems and narrow, grey-green leaves. Sky-blue flowers with five petals appear in summer, followed by round, dry capsules containing several glossy, oval, flattened brown seeds. 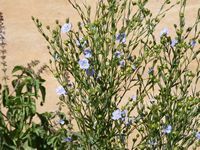 Flax needs well-drained soil in sun and dislikes being transplanted. 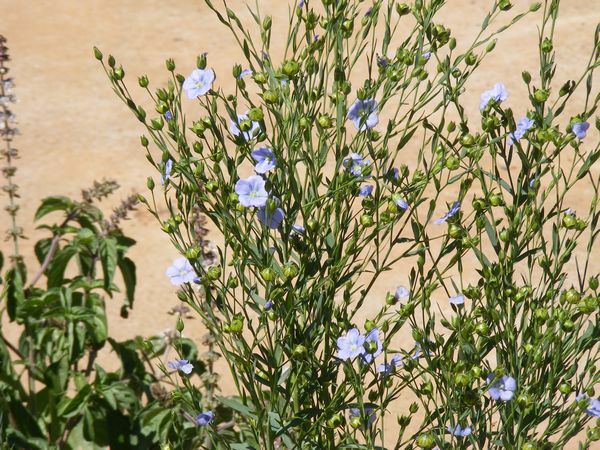 Flax is one of the world's oldest crop plants - it is a food as well as a fiber crop. Flax seeds can be eaten raw or cooked - the sprouts are edible, with a slightly spicy flavor and can be added to salads. Flax seeds are also added to breads and cereals, infused as a tea or roasted as a coffee substitute. Plants are cut when mature for fiber - seeds are collected when ripe. Flax seed contains high levels of dietary fiber and one of its main components is lignan, which has plant estrogen as well as antioxidants. Flax seed contains up to 800 times more lignans than any other plant food. One hundred grams of ground linseed supplies about 450 calories and contains Vitamin B1, B2, B3, B5, B6, B9 and C, calcium, iron, magnesium, phosphorus, potassium, zink and saturated-, mono-unsaturated and poly-unsaturated fat. Crushed flax seeds mixed with cereals and enough liquid can be used internally as a bulk laxative for chronic constipation and diverticulitis - macerated seeds will treat gastritis and pharyngitis. Studies have shown that when flax seeds are included in the diet, it may lower cholesterol levels and benefit individuals with certain types of breast and prostate cancer, eczema, menstrual problems, arteriosclerosis and rheumatoid arthritis. 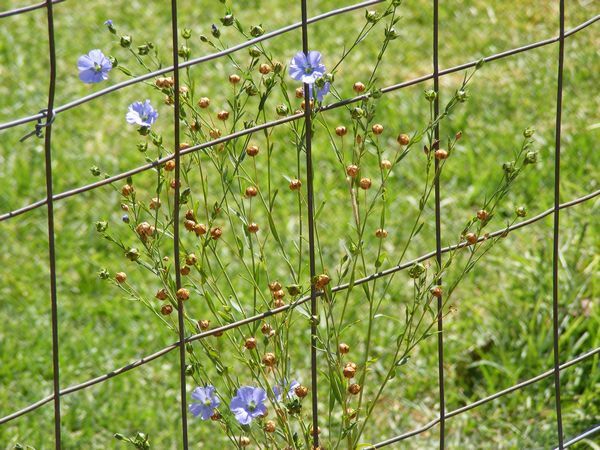 Flax fibers (taken from the stems) are naturally smooth and straight and two to three times stronger than those of cotton. The best grades of fiber are used for linen fabrics such as damasks, lace and sheeting - it is also a raw material for the high-quality paper industry where it is used for printing banknotes and rolling paper for cigarettes and tea bags. Coarser grades are used for the manufacturing of twine, toweling, matting, rugs, canvas, bags and ropes. 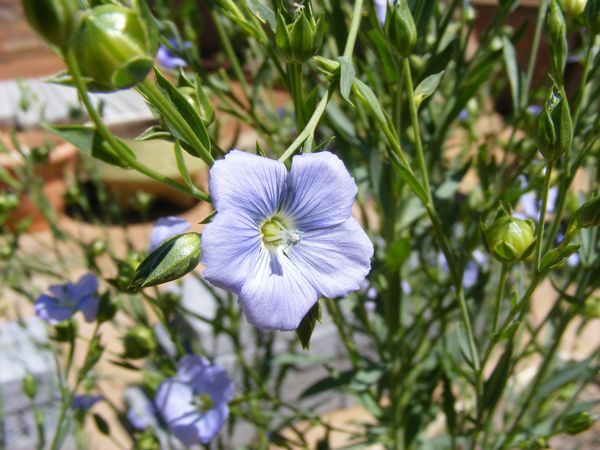 Flax seed contains 38 - 40% of a drying oil which has a very wide range of applications. The majority of oil is used by the paint and varnish industries - the remainder is used in furniture polish, enamels, linoleum, oilcloth, printer's inks, soap making and patent leather. Flax seed oil is also used as a wood preservative and as a waterproofing for raincoats, slickers, and tarpaulins.